"Let me put this another way. If I am not given complete and unfettered command of this situation you can, if I may put it politely, sir, take this job and put it where you choose, because I'll damn well quit." Historical figures, especially those that are larger than life, can almost be guaranteed to provide artists with a platform for great work. Dwight "Ike" Eisenhower, who not only held the power of Supreme Allied Commander during World War II but later became one of the most popular American presidents, is a rare exception to this rule. His mannerism and outlook on life did not fit the prestigious titles he held because, as many who knew him will tell you, he was the "everyman." 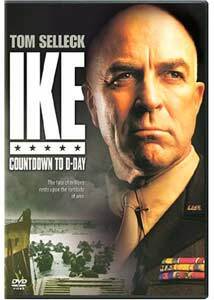 Ike: Countdown to D-Day captures this element of the famed General well, but it also makes the movie somewhat dull. Those who have devoted a great deal of time to studying World War II should be very impressed with this production. Apart from a few minute details, it is an historically accurate account of not only Eisenhower the man, but also of the three months leading up to the Allied Forces invasion of Normandy on June 6, 1944. It is a very handsome staging of this time period—it's surprising it took only 20 days to shoot—and features some good acting. However, Eisenhower's life and career were a study in calm statesmanship and bureaucratic management, which doesn't make for a very cinematic experience. Director Robert Harmon brings a well-polished, claustrophobic look to the film, which begins with Eisenhower (Tom Selleck) delivering an ultimatum to Prime Minister Winston Churchill (Ian Mune). If he is not given complete control over the invasion of continental Europe, Eisenhower threatens to resign. Against the wishes of politicians and British generals, most notably Montgomery (Bruce Phillips), Churchill supports Eisenhower. The arguments and drama of the military's hierarchy will interest those who have done their homework on the subject, but will probably be too talkative for most viewers. The script, written by Lionel Chetwynd, has one too many speeches in it. The dialogue never feels like it is out of character, but how long can one look at Tom Selleck standing in makeup while reading lines? This is not to say that Selleck does not do a good job, because he does. At first it may be jarring for those who grew up with images of Eisenhower to accept him, since there is little physical resemblance between the two men, but Selleck subtly captures many of the defining trademark characteristics of Eisenhower. Apart from giving a heartfelt and sincere portrayal of Ike's personality, he also gets many of the mannerisms (such as smoking cigarettes and posture) down cold. Equally impressive are Ian Mune, who may not give as flamboyant and powerful of a performance as one would hope—but could anybody do as good a job of acting Churchill as Churchill did himself? The problem with the cast comes from the smaller roles of major figures that have been portrayed elsewhere. Take Gerald McRaney's turn as General Patton. Anybody who has seen George C. Scott's brilliant portrayal in Patton will find this to be a weak scene that diminishes Patton's intelligence. Since it comes early in the movie, it will not be likely to spoil the whole show. However, near the end Charles DeGaulle (George Shevtsov) arrives and is depicted miserably. Many will admit to DeGaulle's flaws, such as being an egomaniac, but the writing and Shevtsov's performance make him out to be a cartoon character. The fact that the movie does not even acknowledge that he did eventually support the invasion, or at least indicate that such an event would occur, is an unforgivable misrepresentation of history. Yet despite these flaws, Ike: Countdown to D-Day does accomplish what it set out to do. It gives a thorough portrayal of Eisenhower and the anguish he experienced when contemplating how best to achieve his goal while minimizing harm to his soldiers. Unfortunately, decision-making is not very cinematic (film is a medium based on seeing the results of a decision) and the movie suffers as a result. The admiration the filmmakers feel for Eisenhower is evident throughout, but it isn't enough to have the movie appeal to an audience beyond history buffs. Image Transfer Review: The original aspect ratio of 1.78:1 is preserved in this anamorphic transfer. The image is crisp with a lot of depth and solid contrast. Darks are strong and skintones are accurate. The colors are muted, but this is a result of the source material. It isn't a flamboyant transfer, but it is a pleasant viewing experience. Audio Transfer Review: The Dolby Digital 5.1 track provides some nice sound separation and directionality. Dialogue is clear and the music sounds nice coming from the surround speakers. There aren't many opportunities to give a home theater system much of a work-out, which leads to a slightly front heavy mix. However, there is enough of a dynamic quality to create a nice sound environment that does not distract from the image. Extras Review: There is some nice supplemental material on this disc, starting with previews for other Columbia TriStar Home Video titles. The trailers for Secret Window and Big Fish are presented in anamorphic widescreen and Dolby Digital 5.1. The trailers for The Fog of War and From Here to Eternity are in Dolby surround, with the former in nonanamorphic 1.85:1 widescreen and the ladder in 1.33:1. As for material relating to the feature, Ike: The Filmmakers Reflect (18m:13s) is a collection of interviews with Tom Selleck, director Robert Harmon, and writer Lionel Chetwynd. They talk about certain difficulties in filming and Selleck explains the research he did for the part. The most interesting part relates to everybody's reluctance to cast Selleck as Ike (including Selleck himself). The other extra is an audio commentary with the three men, which repeats some of the material from the documentary but also adds other information (such as Tom Selleck acting in all of the insert shots of hands and such). The three men spend more time discussing their opinions about Eisenhower than the actual making of the movie. There are a few too many stale jokes on this commentary track for people who aren't big fans of the movie, but all three of the men have pleasant voices that are smooth listening. Neither of these features is extremely interesting, but fans of the movie will probably enjoy them. Ike: Countdown to D-Day will be an enjoyable movie for those who are interested in the history it depicts. For others, however, it will feel like nothing more than a well-made television drama instead of the epic spectacle most think of in connection with World War II. This DVD has a nice sound mix and image transfer with some good extras, which makes this worth a purchase for die hard WWII fans.